If you’ve been to the grocery store recently, you’ve probably seen the gorgeous whole artichokes adorning the vegetable aisle. Simply prepared artichokes can make for an easy, intriguing, and healthy appetizer. You can grill, steam, and roast them until the leaves can be easily removed and dipped into your sauce of choice. 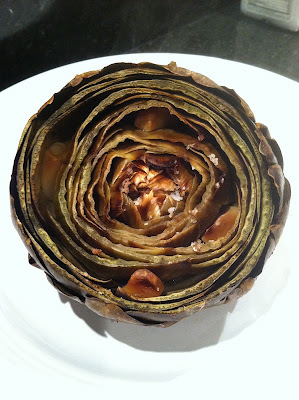 We decided to try roasting the artichoke this time, and it yielded by far the best results. 1. Preheat an oven to 450 degrees F.
2. Cut off the top quarter and stem of the artichoke. 3. Remove skin from garlic cloves and stuff 3-4 of them within the artichoke leaves. 4. With the stem-side down on your baking sheet, liberally drizzle each artichoke with olive oil, lemon, and a dash of salt. 5. Wrap individual artichokes in tin foil and bake in the oven for approximately 1 ¼ hours, or until the leaves pull off easily and the artichoke meat is tender. 6. Allow artichokes to cool, just enough to handle. Serve with an aioli or the leftover marinade. The garlic should have almost a buttery consistency at this point, and is fantastic when smeared over the artichoke meat. We had to Google “how to eat a whole artichoke” the first time we made this dish. It’s not something everyone grew up learning how to do, so we’ve provided you a brief summary of the process. As you pick each leaf from the artichoke, use your teeth to scrape the meat located at end of the leaf closest to the artichoke’s heart. Once you've removed all the leaves, you'll notice fuzzy stuff, also known as the "choke." Scrape out the fuzzy pieces, leaving the bottom, or heart, left for you to continue dipping in your sauce.